Henry Leo in his BSJ, Baby Bell Bottoms, Saartje’s Bootees, and Sweet Baby Cap. Photo by his mom, Kelly Sue. Keep an eye out for this outfit in the Winter Spin-Off. I’m anxious to see what they did with it. They sure asked me a heck of a lot of questions! No, I have never! Ook at the wittle bitty tweetie….Awwww. (I am reduced to gibberish.) How gratifying to see everything looking so good together–but as you have reminded us, handknits don’t clash! I nearly died from the cuteness. There should be some sort of warning. 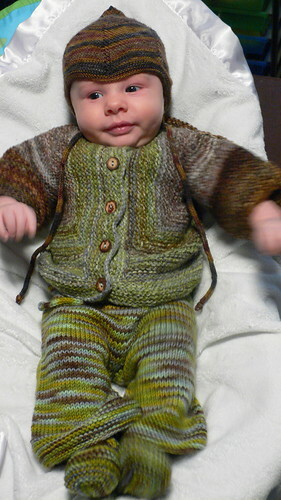 No, I’ve never seen so much handknit goodness on that cute baby boy. Lovely! That is so wrong in so many ways! Honestly, I’m not much for babies, but I had to call hubby into the room to check this one out. What an adorable outfit!!! What a lucky baby! I’ll be watching Spin Off! You’ve done some marvelous things with handspun, Adrian. Oh my goodness – he is adorable in his little outfit!! No, never! That is the cutest thing ever. I love the colors too. Congrats on appearing in Spin Off-I’ll look for it. Oh my, what a wonderful bundle of wooly goodness. Nice dye job. I love the colors. Congrats on the article in Spin-Off. Can’t wait to read it. Way too cute!!!! He is just precious, and the handknits put him right over the top!! Now that is my idea of a perfectly tricked-out baby! Awwwwwwww! Cutest woodland baby ever. Those are all keepers or at least passer-downers! Amazing baby clothes. Oh no! Now i must subscribe to spin-off! This is all going to kill me!! Oh, my, what an adorable ensemble! That little cutie is definitely the best-dressed in handknits. I love his blurry little hand! i love this baby…. i showed my husband what our future “spawn” would look like… i had to explain – not the face – the knitting!!!! Ok, seriously? I have great, gigantic, green envy of this sweater, and it took me a few weeks to figure it out. I thought to myself, “Self… if only you find the RIGHT YARN, you too can create a gorgeous sweater of GLORY.” A ravelry project and flickr image search later and I’ve discovered the yarn that I think could make a credible substitute for your gorgeous handspun…yes, that’s right, fat sock yarn… only to discover you’re the creator of both, and there is no more fat sock yarn. How is a girl who is new to this whole knitting blog community to know that it’s all you!! That’s when I came to terms with the fact that I wasn’t “inspired”, I was just “jealous”… and I’ll stay that way ’til there’s more fat sock yarn! !